The election of Donald Trump was a seminal moment in modern American history, as one of the important things it signaled was a need for a fundamental reassessment of U.S. foreign policy. Yet no matter how costly in terms of blood and treasure the status quo may be for the average American, the brahmins of U.S. foreign policy dare not countenance any questioning of it. One of those unquestioned foreign policy commitments is the permanent presence of U.S. troops (and some of their families) in South Korea. Although South Korea is wealthy and has a modern military the country is threatened by its unpredictable neighbor to the north. The threat South Korea faces is compounded by North Korea’s undying commitment to obtaining a nuclear weapons arsenal (something that the South Koreans do not have—and surprisingly don’t want). Traditionally, this has been the argument in favor of our continued presence on the peninsula. It remains unknown, however, whether North Korea’s leadership is truly insane enough to launch a full-scale war against South Korea, should they acquire nuclear arms. At present, North Korea has enough conventional weapons pointed at Seoul to obliterate it in the first half-hour of any fight, so it’s a bit beside the point. But let’s also not forget that no matter how bloody another Korean War would be, the United States and South Korean forces would prevail in the end. So, while one cannot discount the possibility that North Korea’s leadership is crazy, the fact remains that most geopolitical analysts insist Kim Jong-un is quite sane. Kim’s regime appears content to negotiate with the Trump Administration rather than engage in the standard nuclear brinkmanship that has defined more than 50 years of U.S.-North Korean relations. It’s also clear Pyongyang is not going to denuclearize any time soon. It’s possible, however, that Kim only wants nuclear weapons as a deterrent against invasion (proving the claims about him being a rational actor are true). All of this is to say that whatever our continued presence in South Korea may be achieving, it is not serving as a preventative measure against a third world war. Instead, the U.S. military presence may be a barrier to basic negotiations. If both the mainstream expert opinion about Kim Jong-un’s mental state and President Trump’s instincts about the North Korean dictator are correct, then removing U.S. forces might be the key to bringing lasting peace to the Korean peninsula. What’s more, the continued presence of American troops not only provides a panicky North Korea with tempting targets, it also brings North Korea, China, and Russia closer together when Washington should be attempting to separate the three. 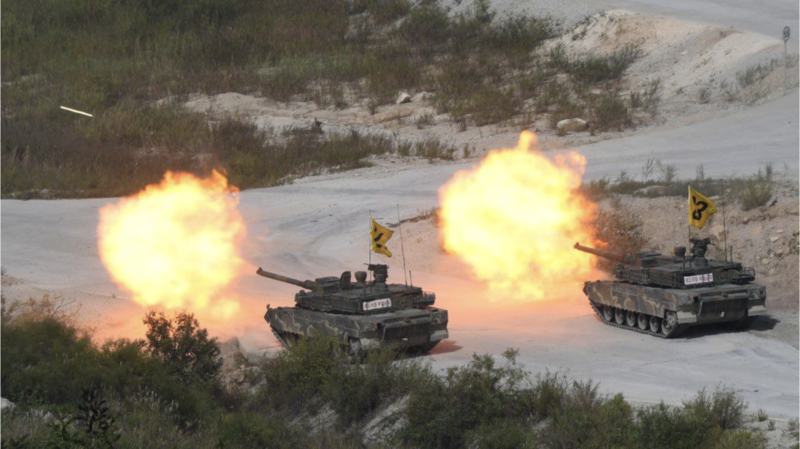 China in particular has been willing up till now to do just enough to prevent all-out war in Korea, but not enough to end the threat decisively. Beijing also wants nothing more than for American forces to withdraw from the Korean peninsula. Undoubtedly, China’s influence would expand if the United States did depart. On the other hand, once Beijing and Pyongyang no longer shared a common American threat their differences—of which there are many—would rise to the surface. Remember, one reason Kim Jong-un murdered his half-brother in Malaysia in 2017 with a nerve agent was that he feared the half-brother was working with Chinese intelligence to overthrow him. Once their common American foe was no longer a factor, Kim Jong-un would once again face a threatening neighbor to his north. China, likewise, would feel threatened and act accordingly if Kim possessed a reliable nuclear weapons arsenal. And Russia, which has a close relationship with the Kim family, would not take kindly to any threat posed to Kim’s reign from China. Anyone who replaced Kim Jong-un as leader of North Korea would be far closer to China and effectively would lock Russian influence out of North Korea (weakening Russia’s presence in the Far East is a long-term strategic goal of Beijing’s). The United States gains little by remaining on the Korean peninsula. Washington should begin a phased withdrawal of its forces coupled with sustained diplomacy with Pyongyang. It might not result in denuclearization, but it could result in a more sustainable peace. Once U.S. forces are gone, only the region’s local actors will be left. And, nothing kills a toxic relationship—such as the one between China and North Korea—like proximity. For once, the United States might end up taking the role of a neutral mediator in any future conflict in northeast Asia. That is much to be preferred over being at the front of a potential nuclear conflict on the Korean peninsula. Check out American Greatness for more great content!